Join us in a booming industry. Aged, Community and Disability Services are the fastest growing employers in Australia. We need hundreds of new workers each year to meet the growing demand. 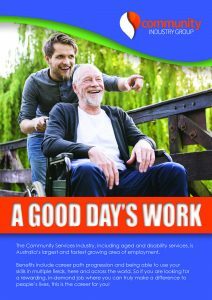 To see our A Good Day’s Work brochure click here. The brochure is also available in Farsi, Burmese and Arabic.